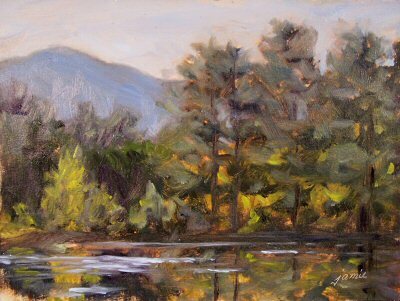 This 12×16 oil painting was started on location, and finished up today in the studio. It highlights the strong oranges present in the landscape in fall. Nowhere is that more apparent than on the blazing orange-red fields at Ward Pound Ridge Reservation, where the brilliant tree in the foreground is lit up with additional rusty and orange tones. I’ve made a pact with myself to start doing sketches every Saturday. I have some Saturday paintouts coming up, so there may be times when I need to do “Saturday Sketches” on a different day instead, but I’m going to try to stick to posting them on Saturdays. I’ve received so many comments from viewers who enjoy seeing my sketches, and the drawing practice is very important. 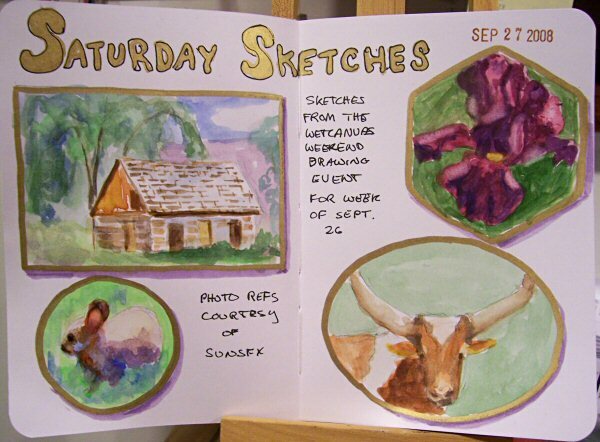 I almost always sketch from life, but today I checked into the Wetcanvas Weekend Drawing Event and couldn’t resist doing some watercolor sketches from those beautiful reference images! Check it out sometime; there is a different host every week, and the images are usually posted on Fridays, in plenty of time for everybody’s weekend enjoyment. The Catskill Mountain area has some of the most exquisite vistas in the Hudson River Valley. Roads that wind through woodlands suddenly open up to fields with tremendous, breathtaking blue mountains looming in the distance. This scene fell so perfectly into a square format that I considered myself very fortunate to have a 12×12″ panel with me! 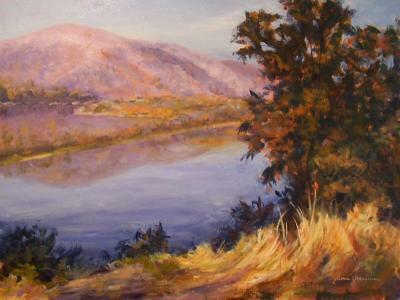 I started this painting in early afternoon, and the light on the scene got better and better as the afternoon went on. $1,050.00 plus $40 shipping and insurance within the Continental United States. For local sales, shipping charge will be allocated to NYS Sales Tax. Please email me at JamieWG@aol.com for International purchases or with any questions. This painting was done from a photograph and a small color study of the scene that I painted a few weeks ago. You can see the color study here. It is a fall view overlooking the Hudson River from private property in Garrison, New York. I may still tweak a few things on the larger version and will try to get a better photograph of it soon! 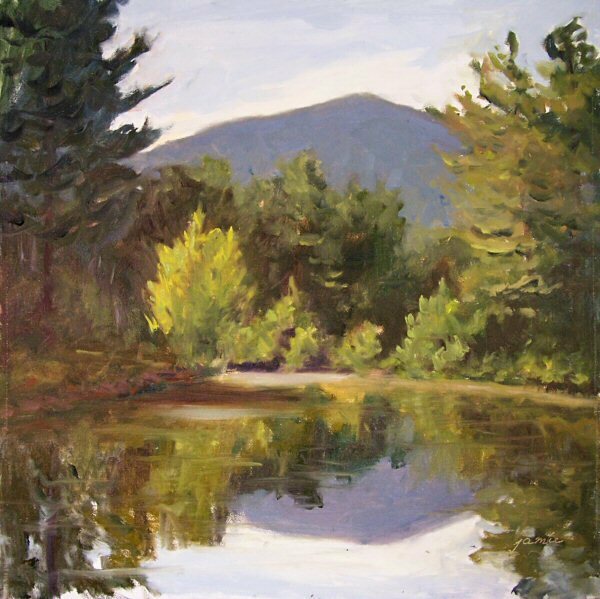 I just got back from a plein air painting trip to the Catskill Mountains. 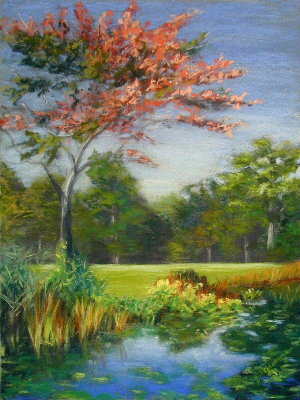 This little 6×8″ oil painting was done beside a charming pond in Acra, New York. As I approached the pond from the far side, it didn’t look all that interesting. Then I turned around and saw that huge mountain looming in the distance! Wow! I’m told it is Windham High Peak. It felt wonderful to pull out the oil paints again! I’ve gotten really hooked on the Golden OPEN paints, but oils sure are great too. These little wooden figures are so much fun to paint. 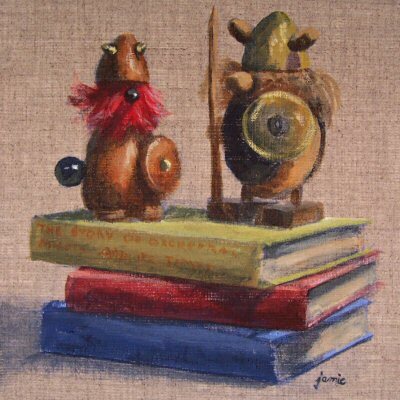 I paired them with three small, old books for my Full House painting. 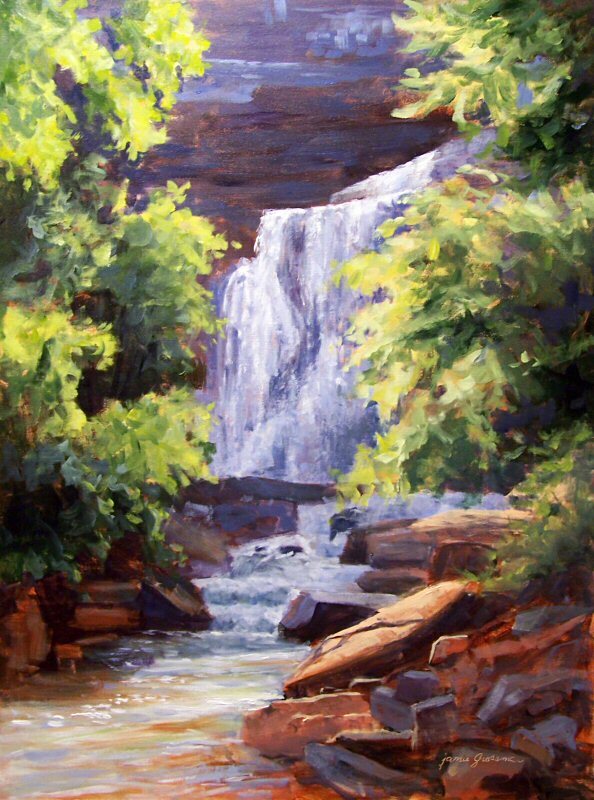 This large painting was done using my plein air study, “The Base of Kaaterskill Falls”, as a reference image, along with a photo I took at the scene. I did a value underpainting in Transparent Red Oxide before going in with local color. One of the things I love about the Golden OPEN paints is the way the underpainting shows through without mixing and muddying the color. I would have had to wait for my oil paints to dry before continuing in order to achieve some of the effects I got here with Golden OPEN. 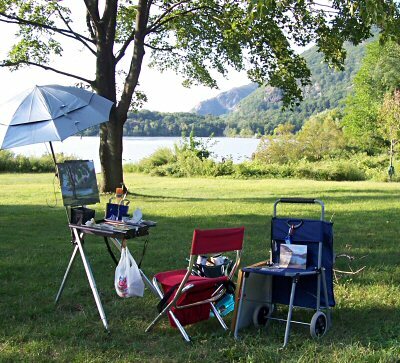 This was one of the spots painted by many of the old Hudson River School painters, and many of the new ones too! This painting is just the bottom tier of the falls; there is another tier above! 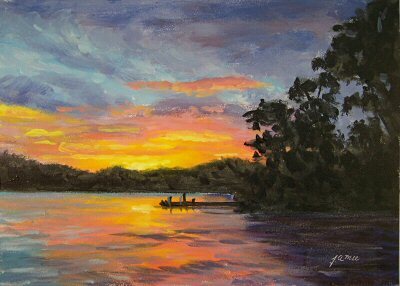 Four artists who have been using the new Golden OPEN paints were selected to do interviews with Mark Golden for his online magazine Just Paint. I was one of the lucky few who shared my experiences with the OPEN acrylics in the article. You can click here to read a full color, PDF version of the magazine with images, or instead you can read a text version with no photos on the website. Either way, I hope you enjoy it! You can post any comments you have to me about the article by clicking “comments” below. 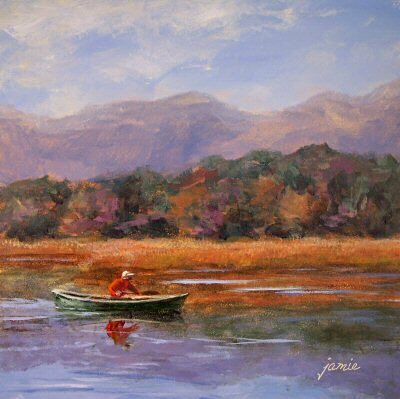 I once knew a wonderful painter named Mike Pacitti, who passed away a few years ago. He used a few different colors to underpaint with. One of them was called Burnt Carmine, made by Rembrandt. I remember it as a strong carmine/crimson color mixed with black. Even with black in the mix, I was surprised by how strong the color was when I saw Mike use it, and yet his paintings were filled with beautiful subtleties. I decided to try something like that while waiting for clouds to break along the Hudson River in Cold Spring. 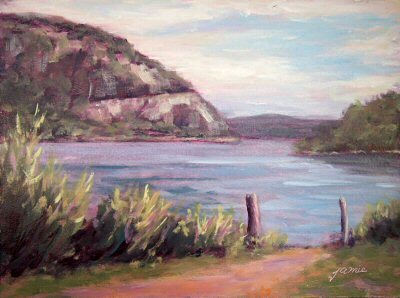 I mixed Quinacridone Magenta half and half with Carbon Black, and used that to do the underpainting for this little plein air. It was much stronger than the colors I normally use to lay out my composition and values. No matter what you use to paint over it, the magenta seems to work its way through. Part of me thinks it still comes through too much. Another part of me thinks I’m just not used to it, and that I kind of like the effect. 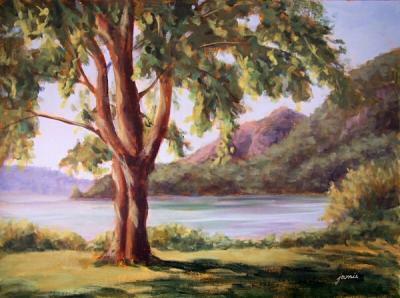 This was painted late in the afternoon on location in Cold Spring, New York. It was one of those perfect pre-fall days, filled with the glow of the late day light and the Hudson River breezes. I took the photo below after completing the painting, so the light and shadows had changed somewhat from the time I started. I kept going out to the car to get more things, so you can see that by the end of the day, I had accumulated enough stuff on site for three artists! This used to be my favorite tree along the lakeshore here. It had such an interesting shape, and the colors were beautifully vibrant as they changed with the seasons, leaving the intricate branchwork in winter. The entire left part of the tree came down in a storm last winter, and I miss it! It was one of my favorite painting subjects. Now the fullness of the leaves is gone, and the shape is not as inviting. This one was done from a photo taken before the tree’s mishap. Above is the completed painting, and below is an image of the work in progress. I’d initially planned to put in foreground grasses, but after doing that, I felt the painting was more effective without them. So, I worked on it yet a third time, and took the foreground grasses out! It’s interesting how much the color of light affects what we see. The image of the finished painting was taken with the corrected light of my photo box, but the progress image was taken in cool daylight. The actual colors in paintings vary according to the lighting conditions where we view them. I did the underpainting for this work with a color I’d not tried before from the Golden OPEN line—Quinacridone Gold. I love the warm glow that it brings to the work. I could get hooked on this color! 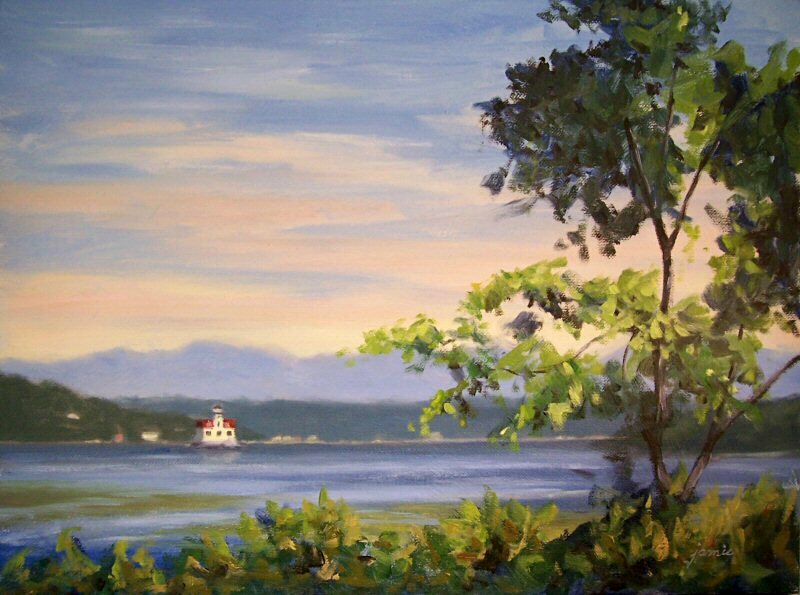 This is painted from a photo I took down in Constitution Marsh on the Hudson River. It’s been in my file of things I want to paint for a long time! 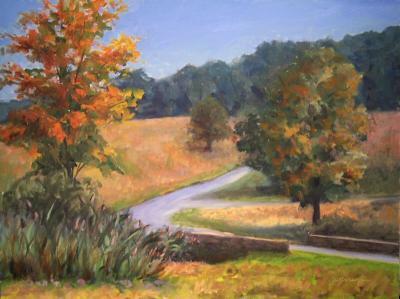 With fall on the way, it seemed the right moment to pull out this lively autumn scene. $525.00 plus $30 shipping and insurance within the Continental United States. For local sales, shipping charge will be allocated to NYS Sales Tax. Please email me at JamieWG@aol.com for International purchases or with any questions. A few weeks ago, my husband and I drove to the other end of the lake to get western views of the sunset. We took loads of photos. This is my first painting from that series of images. I managed to stop myself a few times along the way to take some photos and post a demo. 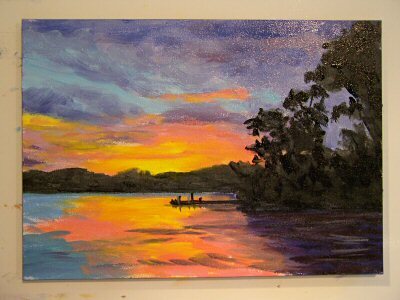 I set up to paint with more colors on my palette than usual in order to get the more highly saturated sunset colors. 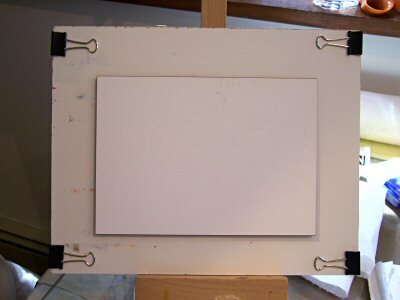 When I paint on a small board like this 5×7″ Gessoboard above, it’s hard to hold it and paint edge to edge. I use “blu tack” and affix it to an 8×10″ board. Then I can hold the larger board and be able to paint all the way to the edges without getting paint on my fingers, or I can set it down on a little tabletop easel. 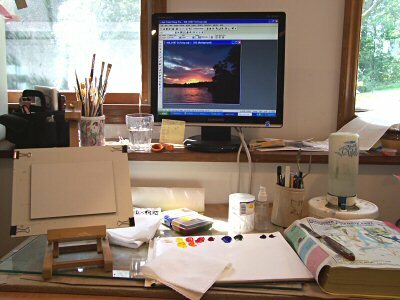 My computer monitor yields stronger, more accurate color and chroma than a printed out photo, so I like to set up like this for small works and paint right off the computer screen. I use the old telephone book on the right to wipe my brushes before rinsing. It’s a great way to conserve paper towels and simultaneously recycle and old phone book. When the page gets filled with paint, I just tear it off, toss it, and go to the next page. I have 22 freshly varnished oil and acrylic paintings in these drying racks. Over the past several days they’ve been getting isolation coats and varnish coats. Many artists who paint in both mediums have asked me for information on my varnishing process, so I thought I’d take some time today to describe my process. There are several different products that can be used to obtain a variety of finishes depending on personal artistic preferences. I love gloss varnish. It pops the colors and values and gives a shiny, professional appearance. I have chosen products to yield that result. There are many other good products on the marketplace too. I start with Golden Soft Gel (Gloss) and relatively soft, synthetic brushes to do an isolation coat on the acrylic paintings. Oil paintings do not require this step. I use the small container shown above to measure. The Gel gets diluted two parts Gel to one of water. I mix it up thoroughly in a styrofoam bowl. I clean off the painting surface with a lint free rag to be sure there are no dust particles on the surface. Then each dry acrylic painting gets a thin coating, following the direction of the brushstrokes. One coat is generally enough to seal a relatively non-porous surface, such as my sealed, primed hardboards. Rag paper and matboard, even if sized before painting, generally requires 2-3 thin coats. You can tell when you’ve put on enough coats because the surface develops a soft sheen. 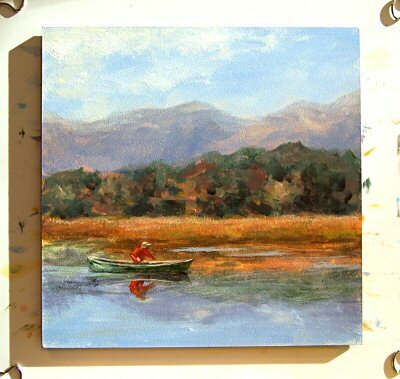 Many acrylic painters make the mistake of eliminating the isolation coat. That results in too much varnish penetrating through the surface of the support, and can cloud your painting. Also, it will leave an uneven finish. Putting on enough isolation coats to prevent penetration of the varnish yields a beautifully even gloss. It is well worth the additional steps! The second isolation coat can be applied several hours after the first if necessary. Be sure the first coat is dry, and not tacky. 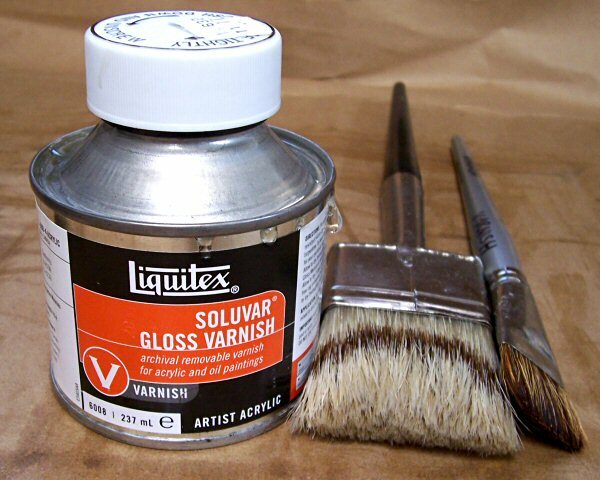 I like the Soluvar Gloss Varnish a lot for both oil and acrylic paintings. 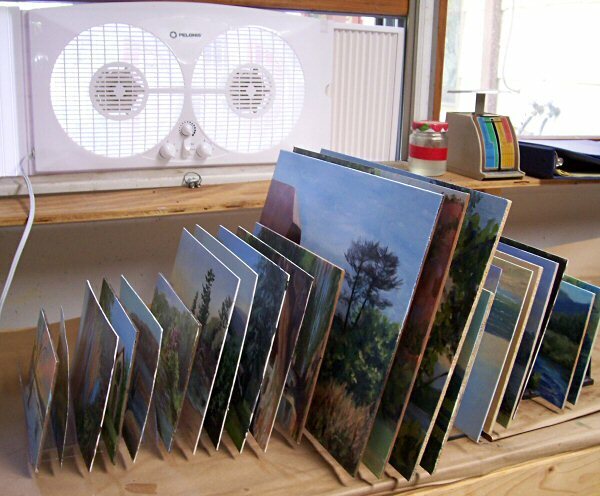 Be sure your oil paintings are completely dry before varnishing. That will generally take 6-12 months. Acrylic paintings can be varnished as soon as the isolation coat has cured. In dry, room temperature conditions, that should only take a few days. Soluvar varnish is removable for cleaning, non-yellowing, and gives a great sheen. I used to use Gamvar, but found I had some adhesion problems on sections of some of my oil paintings, and the varnish would bead up as it was applied. I have not had that problem with Soluvar. I use the large, natural hair brush above for paintings 12×16 and larger, and the smaller natural/synthetic blend brush for smaller works. You need to work quickly with varnish before it dries. I pour a small amount into a ceramic pot that I reserve for varnishing. I dip the bottom section of the brush in and wipe some off on the side of the pot. Varnish your painting section by section, overlapping sections as you go. I lie them face up once done until they are tacky. Although varnish should be applied too thin to drip, I always take that precaution. It’s better to be safe than sorry! I got inexpensive, small letter holders (above) at Staples, and each can hold five paintings upright. 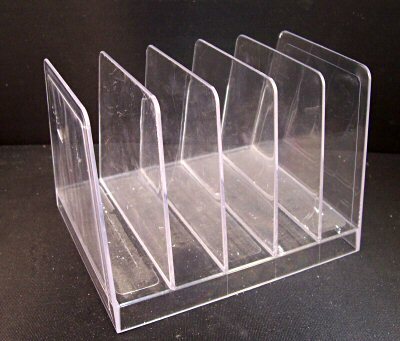 They are only a couple of dollars each, and about 4″ tall. I bought them a couple at a time as I needed more and more of them. Once the paintings have tacked up, I set them in the letter holders. The first photo in this post shows what the paintings look like when they are set into a series of these letter holders. You can also see on that first image, that a fan above the paintings draws the solvent fumes out of the room while I work. I have another fan on the other side of the room, by an open door to the garage, that helps push air across the room and out. That way, my paintings will dry faster and I can simultaneously vent the fumes out of my work space. Once the paintings are varnished, I give them a couple of days to dry fully (in dry weather) before framing them. I hope this little demo helps some of you who have been struggling with varnishing. If you’ve been avoiding it, you’ll find it’s a lot easier than you thought, and the result is well worth the little bit of time and effort. Your paintings will glow with a new life! 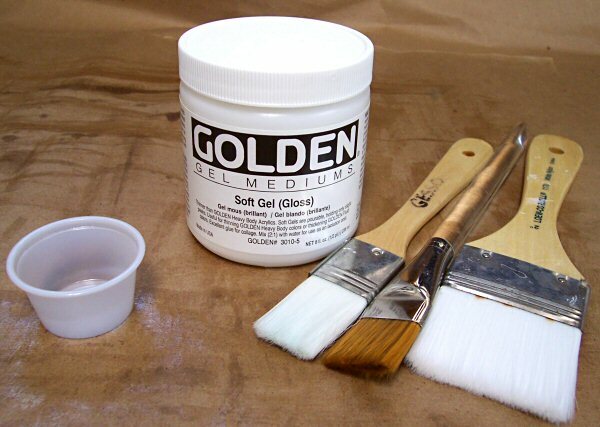 You can read more about varnish application techniques in this article on the Golden website.